Classrooms are noticeably more hi-tech these days - interactive boards, laptops and online learning plans proliferate, but has the curriculum actually changed or are children simply learning the same thing on different devices? Some argue that the education this generation of children is receiving is little different from that their parents or even their grandparents had. But, in a world where artificial intelligence and robots threaten jobs, the skills that this generation of children need to learn are likely to be radically different to the three Rs that have for so long been the mainstay of education. The BBC went along to the Bett conference in London in search of different ways of teaching and learning. A stone's throw from the Excel, where Bett is held, stands a new school that is, according to its head Geoffrey Fowler, currently little more than a Portakabin. Despite this, the London Design and Engineering university technical college - which caters for 14- to 19-year-olds - was massively oversubscribed when it opened its doors for the first time in September. The 180 pupils lucky enough to have got a place have had a very different experience of the curriculum in the 12 weeks since they joined. One group have designed from scratch a virtual reality environment that takes viewers on a journey around an Ethiopian village as part of a project to highlight the work of the charity Water Aid. Another has spent the term teaching Pepper - the school has two of SoftBank's human-looking robots - how to make a variety of moves, including the dab currently beloved of children around the country. A third group are heading off this weekend on an unusual skiing trip. 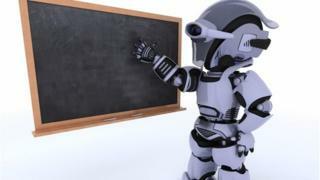 Travelling with them will be 11 Nao robots, which the pupils plan to teach how to ski. The school - which sets no homework, relying instead on pupils wanting to get on with their projects in their own time - is, according to Mr Fowler, "inspiring children to be part of a new type of learning". While other schools may see the projects listed above as fun "add-ons" to the core curriculum, Mr Fowler thinks it has to be embedded within it. Sixth-formers work on what is called an extended project qualification, which is the equivalent of half an A-level. The school works with a range of industry sponsors, including the University of East London, Thames Water and Fujitsu, all of which offer input into the types of skills they would like to see children learn to equip them for the workplace as well as offering apprenticeships. There are 48 university technical colleges (UTC) in England currently - and the scheme has proved controversial. One set up in East London in 2012 closed after just two years, having failed to attract enough pupils, while another in Bedfordshire was branded inadequate by Ofsted. Some head teachers seem to be resisting the idea of the vocational style of education, barring UTCs from recruiting pupils from their schools. But statistics suggest that pupils attending UTCs have just as good results if not better than those in more conventional schools. It is something James Culley, head of computer science at the school, sees for himself every day. "I have never seen students learn so quickly," he told the BBC. Lots of primary schools are now convinced of the importance of learning to code. As well as lessons devoted to it, after-school code clubs proliferate as do DIY computers such as the BBC's Micro Bit and the Raspberry Pi. Hundreds of schools in the US have taken up the idea and it is now preparing to launch in the UK. Schools typically buy between six and 12 drones via Tynker's partnership with drone maker Parrot and can then download Tynker's free set of drone lessons. Children learn to make drones do back-flips, as well as more complex idea such as drones working together as a team. It would take, you may think, a rather brave teacher to commit to flying drones in the classroom, but Josie McKay, a Fourth Grade teacher at Towne Meadow Elementary School in Indiana has no such qualms. "Over the last month, I have seen their confidence build as they went from coding their drone to hover off of the floor to flying their drone around the room without crashing into any obstacles," she says. "Each week these students develop new and more challenging goals for themselves, work together, and code their drone accordingly. "The excitement on their faces when they achieve their goal, especially when it is completed in a short amount of time, is infectious." The drones come with a range of safety features, including a "classroom mode" that means they take off extra slowly. Children cannot take command of each other's drones, and there is an automatic stop button if inquisitive fingers come in proximity with the drone's blades. Tynker founder and chief executive Krishna Vedati told the BBC: "Our goal is not to create programmers but to offer coding as a life skill." Picture a classroom where, instead of handouts or text books, all pupils learn from their own headset - entering a virtual reality world to learn about the French revolution, or interacting with a hologram of the solar system to learn about space. According to Lenovo's global education specialist, Sam Morris, there are huge benefits from learning this way. "We see AR and VR as the next frontier," he says. "Early usage has suggested the devices engage pupils intently in tasks, improve group interactions and the ability to adapt to multiple disciplines." Microsoft was at Bett showing off HoloLens - its recently released "mixed reality" headset. It has worked in conjunction with Case Western Reserve University to develop a hologram of the human body that can be dissected and bones, organs and veins viewed in detail. It is also working with education provider Pearson to develop other educational resources for the device. The developer edition of HoloLens currently sells for £2,719 which makes even buying one headset out of the reach for most cash-strapped schools. "The declining cost of VR and AR devices will be critical to driving mass adoption in education," says Mr Morris.